Do you remember the days when you were a kid and you and your best friend would pretend to be samurai or Jedi and fight each other with swords that were sticks or were made of foam? I do. 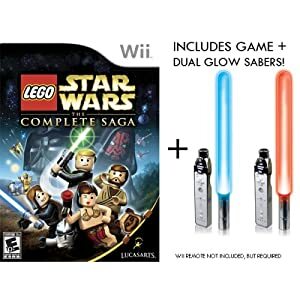 Apparently, so do the great minds behind the Wii, which is why they have released the Sword controller accessory and for those true fans out there, there is also the option to purchases light-up lightsaber accessories too. The Wii foam swords and the plastic light-up sabers were released for Wii Sports Resort and Star Wars The Clone Wars: Lightsaber Duels respectively, though they can technically be used for any game and boy, do they add a greater sense of immersion. Sure, you could swing the controller around without the attachments as they are not required to actually play the games but when you add a bit of weight and a solid, visual representation of a sword into the mix, it really helps to get into the games and cross “blades” with a friend. This truly lends as close of a genuine sword fighting experience as one could get without it being dangerous and within the privacy of your own home. However, other than making the Wii Remote feel more like a sword, these attachments do nothing else to heighten or improve the experience. The only downside to these attachments is the fact that both the saber and sword block the sensor at the end of the remote, requiring you to remove the controller from the holster in order to regain the ability to point at your TV screen. This can be slightly annoying at times but you still retain the functionality of all the buttons on the Wii Remote. Conversely, there are third party options that have ways around the IR blockage, whether it has a function to fold down or some other method. Regardless, these Nintendo accessories are still quite enjoyable and entertaining to use. The prices vary but you should be able to grab either the foam swords or the sabers in a dual pack for around $19.99. So go out and pick up one of these accessories, grab a buddy and let the battles commence. Just makes sure you have enough room and nothing fragile within reach.